What is Mindfulness-Based Tennis Psychology? 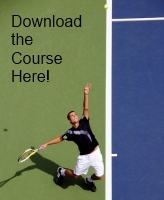 Mindfulness-Based Tennis Psychology (MBTP) is program of mental training for tennis involving mindfulness meditation techniques. It is a new approach to tennis psychology based on the latest sports psychology research, which has shown that mindfulness meditation enhances overall sports performance by increasing an athlete’s ability to function ‘in the zone’i, by sharpening concentration and awarenessii and by improving accuracy and precisioniii. Mindfulness-Based Tennis Psychology teaches us a way of responding more effectively to negative thoughts and experience on court. It is different to other models of tennis psychology because MBTP does not seek to change negative mental experiences in any way. Too much cognitive activity (thinking) is a barrier to flow. So trying to ‘correct’ or change any negative thoughts or emotions, as you would do in traditional sports psychology approaches, will actually make it less likely that you will play in the zone. Instead in MBTP we learn to accept whatever is going on in our minds, and refocus our attention on the task in hand. We learn to understand thoughts and emotions simply as events in the mind which we do not have to react to. This frees us to play to our potential, whatever is happening. Developing mindfulness skills will increase the likelihood that you will enter into flow states and thus play in the zone more often. The meditations are simple to learn and are carried out either sitting in a chair, standing or on court. By practising the 12 guided meditations you will cultivate a non-judgmental awareness of your experience, which will enable you to play tennis with a new sense of freedom, confidence and flow. Download the MBTP Course Pack here. i. Bernier et al. (2009). Journal of Clinical Sports Psychology, 3, 320-333. Kee & Wang. (2008). Psychology of Sport and Exercise, 9, 393-411.
ii. Schwanhausser. (2009), Journal of Clinical Sports Psychology, 3, 377-396. Chambers, Chuen Yee Lo & Allen. (2008). Cognitive Therapy and Research, 32, 303-322. Jha, Krompinger & Baine. (2007). Cognitive, Affective & Behavioral Neuroscience, 7, 109-11.
iii. Gooding & Gardner. (2009). Journal of Clinical Sports Psychology, 4, 303-319.